A tower for the "consolation of souls" was erected in the cemetery at the Manzanar internment camp in 1943 by Ryozo Kado, a stone mason imprisoned in the camp in 1942. Kado, along with almost 120,000 of his fellow Japanese Americans living in the "military zone" along the Pacific coast of the United States, were sent to internment centers throughout the western part of the country following the bombing of Pearl Harbor and the start of war in the Pacific in 1941. Internment followed on over a half century of discriminatory immigration and land ownership laws against Asians in general and Japanese immigrants specifically. It represents the degree to which racial and cultural intolerance can be carried when mixed with the fear and hysteria of war. And it was not formally recognized in the national conscience with an apology and reparations until nearly a half century after the war's conclusion. The history of the event represented in the documents here is at once a story of immigration, significant constitutional issues, racial discrimination, and the lengthy amalgamation of cultures. 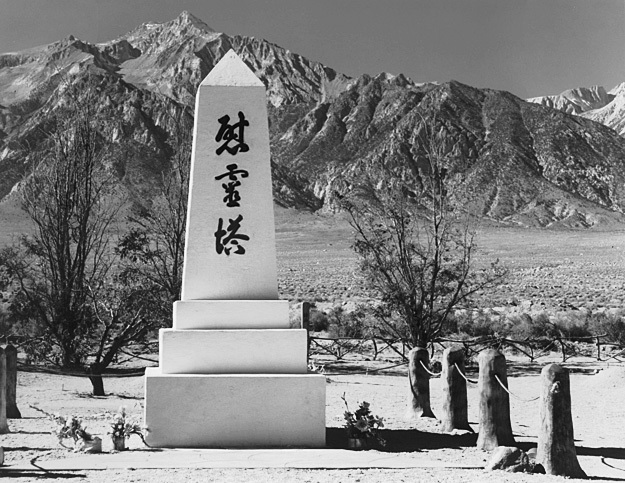 image from Ansel Adams, "Monument in cemetery, Manzanar Relocation Center," part of the Ansel Adamss Photographs of Japanese American Internment at Manzanar, Library of Congress American Memory Collection.